News, reviews, information and apps for Symbian and Nokia. Nokia has released its Q4 2010 results, reporting an operating profit of €884 million (down 23% Year-on-Year), with net sales of €12.65 billion (up 6% YoY). Nokia's device and service division's profits were €1090 million, up 10% from Q3. Margins in devices and services were 11.3% (down 4.1% YoY and up 0.9% QoQ). The financial results just beat market expectations, but overall device sales (123.7 million) were lower than estimated and Nokia issued a lower than expected forecast for Q1 2011 and noted it faced challenges ahead. "In Q4 we delivered solid performance across all three of our businesses, and generated outstanding cash flow. Additionally, growth trends in the mobile devices market continue to be encouraging. Yet, Nokia faces some significant challenges in our competitiveness and our execution. In short, the industry changed, and now it's time for Nokia to change faster." Nokia's Q4 results are the first to include Symbian^3 phones. One notable impact is the increase in the average selling price: converged devices' average selling price rose to €156, compared to €136 in Q3. However, with full sales coming on stream only midway through the quarter, their full impact will not be fully felt until 2011. Thus, Q4 2010 sales in converged devices were primarily based on lower cost devices such as the Nokia 5230 and its variants, with sales of Eseries device remaining an important contributory factor. Looking forward, Nokia now expects a sluggish Q1; it is expecting its Devices and Services margin to be between 7% and 10%, and devices and services net sales of between 6.8 and 7.3 billion Euros. This forecast is lower than market expectations and has contributed to a drop in Nokia's share price (5% down today). Nokia is expected to unveil a revamped strategy at an event in London on February 11th. Nokia overall mobile device volumes were 123.7 million units, down 3% year on year and up 12% sequentially (mainly due to the holiday season sales). This is set against estimated industry volumes of of 403 million units, up 12% year on year and up 11% sequentially. Nokia's overall (phones) market share was 31%, down 4% from Q4 2009 and up 1% from Q3 2010. Average selling price (across all devices) was €69, up from €64 in Q4 2009 and up from €65 in Q3 2010. Nokia says these changes were mainly due to a higher proportion of converged devices sales and currency fluctuations. The average selling price of Nokia's smartphones was €156, down from €186 in Q4 2009 and up from €136 in Q3 2010. This reflects the introduction of the Symbian^3 handsets (sequentially) and an increase in the proportion of lower cost smartphones (yearly). 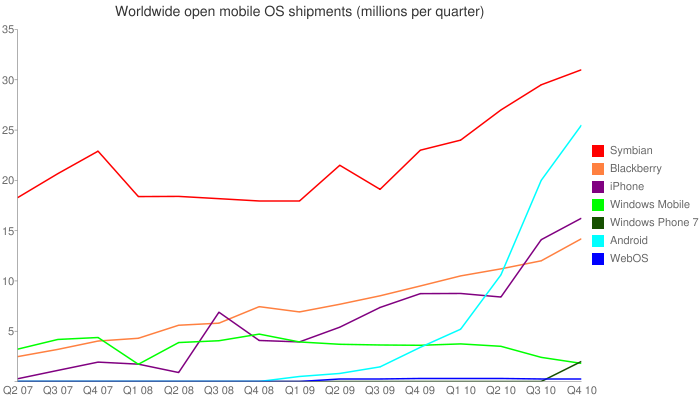 Smartphone shipments in the quarter were 28.3 million (up from 26.5 million in Q3 2010 and 20.8 million in Q3 2009). The year-on-year increase in smartphone sales was 36% and the quarter on quarter increase was 7%. 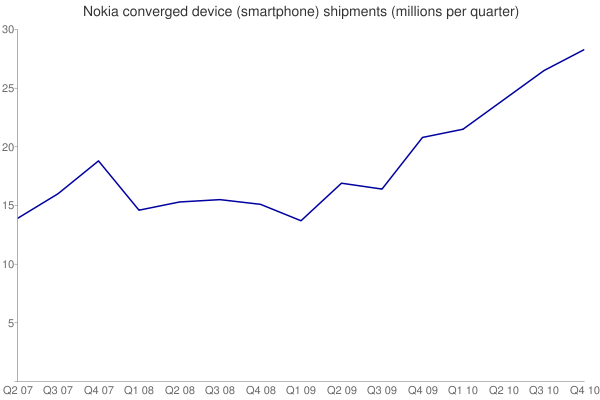 Nokia shipped more than 5 million Symbian^3 devices in Q4. Nokia shipped more than 100 million Symbian devices in 2010. 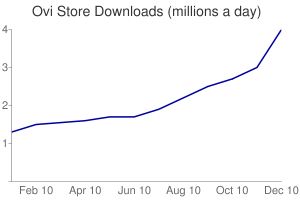 The Ovi Store now has more than 4 million downloads a day (annualised, this would be 1.46 billion per year), up from 2.7 million/day reported in October 2010). 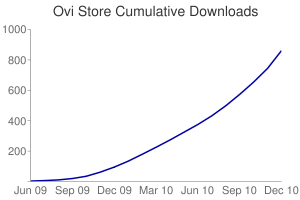 China is a key market for Ovi Store, as are Russia and Turkey, where there are 1 million downloads a week. Ovi Maps now covers 180 countries, with 100 of them navigable. N8 owners are among the most active users, spending up to 4 hours per month using maps and navigating. Stephen Elop, Nokia's CEO, gave a brief overview noting that he had continued his deep assessment of Nokia's strengths and weaknesses. This reinforced his belief in Nokia gems: passion and enthusiasm of people, broad and deep channel reach, strong hardware design capabilities allowing a diverse range of products, great software and service assets, and more. Elop noted that the industry had changed from a battle of devices to a battle of ecosystems, which was representative of convergence of mobility, computing and service industries. Ecosystems exist at both end of the markets, but they have different characteristics. He went on to say that Nokia needs an attitudinal shift, that it must operate as a challenger and speed its execution. The general summary was that: "the industry changed. It's time for Nokia to change faster." Elop outlined several key criteria as a basis for Nokia's strategy: consistently delivering great products ("success begins and ends with great products"), compete on an ecosystem to ecosystem basis (Nokia must "build, catalyse or join a competitive ecosystem"), take maximum advantage of Nokia's gems, have a product basis that guarantees sustainable differentiation, believe in successful execution (should be elegant in its simplicity), and should maximise shareholder value. Nokia will further outline its strategy at its February 11th event. This conference call and question and answer session focused on Q4 performance and the outlook for Q1 2011. The Nokia N8 delivered solid performance in Q4 and received enthusiastic ratings from users. The demand for the N8 exceeded Nokia's ability to supply it. The Symbian^3 products, in general, drive people to use Nokia's Ovi services. When asked about the current competitiveness of Symbian^3, Elop replied that it is "a function of the market we are operating in". In markets where there are a preponderance of competitors (later the US was referred to as 'having a pattern of disappointment') Nokia recognises that there are competitiveness issues. However, in markets with high numbers of existing Symbian customers, the conversions rate from existing Nokia customers has been very encouraging and ahead of expectations. Asked whether he worried about quality or time to market Elop replied, "Quality. We must release great products. If products disappoint, we can do long term damage to our brand".